If you are asking how do I waterproof my foundation, then a makeup finishing spray may be your answer. There are many finishing and setting sprays on the market that make the claim of being waterproof or water resistant. You be the one to decide. Waterproof makeup is great for those times when you need your makeup to hold up. Whether it's due to excessive heat and humidity, swimming or even attending a function where you know you will be shedding tears, it is important that your makeup is not running down or off your face. A makeup finishing spray may be the solution you have been looking for when it comes to making your foundation makeup waterproof or water resistant. A finishing spray is used after you apply your makeup. They lock in moisture and keep your makeup looking fresh and like you just applied it. Finishing sprays can make your makeup last all day long and be resistant to smudges. Now, who wouldn't want that? Water resistant that it you can take a dip in the pool and still have your makeup looking like it was just put on. Locks in skin's moisture so your skin will feel soft and smooth. Sets make up so it will not run after exercising or working out. Used by professional make up artists. Simple lightweight spray sets, holds and extends makeup wear. Helps reduce the appearance of makeup cakeyness, smudging and smearing. Disperses color pigment to help reduce makeup clumping and ease blendability. Helps hold makeup surface temperature to help avoid melting, moving or sliding. Helps alleviate the dry look and cakey appearance on makeup surface and reduces the appearance of fine lines and wrinkles. Works with both liquid and mineral-based makeup for a radiant finish. Works well year-round on any skin type. Oil free formula that is allergy-tested and dermatologist-tested. To apply the spray, simply shake and spray over your makeup once daily or as needed. Model in a Bottle has been featured on the Oprah Show. It comes in both normal and sensitive formulas and is available in a 2 ounce spray. It will set not only your foundation but your eye makeup as well. Model in the Bottle claims to be resistant to smudging, tears, humidity, and water. To apply, spray a fine mist of Model in a Bottle on the face. That is all you need to seal your makeup and eliminates the need for reapplying it throughout the day. 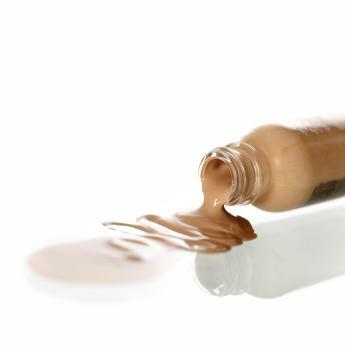 Most brands of makeup offer their regular formula and a waterproof version. Read the product's label to make sure you are purchasing the type you want. With so many options on the market today, you no longer need to ask how do I make my foundation waterproof. A finishing spray is one easy solution for you to consider as well as a formula that is designed to withstand water.